Shepherd's pie is one of those famously classic hearty dishes I love during the fall and winter months. We're kind of on the cusp of changing seasons here on the upper East coast (thank GOD!) so the days are warming while the nights are still a bit chilly. Its no secret how much I love a twist on a classic recipe and this one particularly intrigued me. I love the combination of veggies and how much I can customize the flavors to fit my family's tastes, not to mention it has more of a depth of flavor than a classic shepherd's pie. My husband famously (or infamously) hates peas more than any other substance on the planet...except maybe bananas...so I knew the veggie blend I chose had to leave those out. I went with a simple frozen California veggie blend (carrots, cauliflower and broccoli) and it turned out perfectly. I also love the addition of the mushrooms in the filling, they balance the lighter flavor of the ground turkey, giving the dish a more substantial flavor profile. What are some of your favorite "twist on a classic" creations? Boil sweet potatoes and garlic in a pot of salted water until cooked and soft. Drain and mash with chicken broth, sour cream, milk, salt, pepper and smoked paprika. Set aside. Preheat oven to 400°F. In a large sauté pan brown the ground turkey; seasoning well with salt and pepper. When cooked, set aside on a separate plate. Add olive oil to the pan, and then add the onion and sauté until just starting to soften. Add the celery, parsnips, salt and pepper to taste; cook about 10-15 minutes, until the celery is just starting to get soft. Add garlic and mushrooms; sauté another 3-4 minutes. Add flour, salt and pepper and mix well. Add frozen vegetables, chicken broth, tomato paste, Worcestershire sauce, rosemary, smoked paprika, cooked turkey, and mix well. Simmer on low about 5-10 minutes. 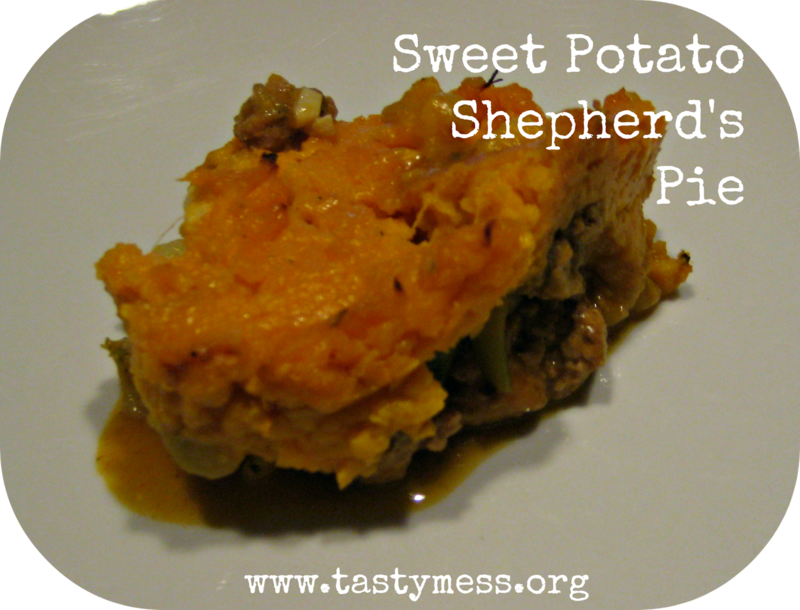 In a large casserole-style baking dish, add the meat mixture and top with the sweet potatoes. Use a fork to scrape the top of the potatoes to make ridges. Bake 30-40 minutes or until the potatoes turn golden. Remove from oven and let it cool 10 minutes before serving.